While printing used to be confined to the professionals, anyone can now print in the comfort of their home or office and produce professional quality prints. 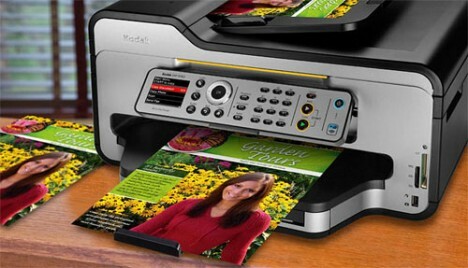 Kodak’s new flagship printer, ESP9250, offers excellent print images, user-friendly features and low running ink costs. Kodak ESP9250 produces prints comparable to those printed in a lab and the ink pigments are claimed to last a lifetime. The printer has a physical control panel and a 2.4 inch color display for easy reviewing of print jobs. The printer can print a 4 x 6 print in 29 seconds and copy about 27 pages in a minute. It has an integrated USB, memory card reader, and an optional Bluetooth adapter. The ESP9250 is also the first Kodak model to offer ready templates through its EasyShare photo organizing software. The software enables easy printing in other designs and formats including graph paper, wide ruled paper, music sheet, lined paper, etc. In addition, the ink for Kodak is relatively cheaper than other competing printers. Notwithstanding its enhanced features, ESP9250 ships for the same price as its predecessor, ESP9, at $250.